It was June 1 2006, we’d arrived in Portland, Oregon and whisked across the border to Vancouver, Washington where we were to attend an important birthday bash of one of our closest friends. I’ve been instructed not to mention the actual age of this close friend so we’ll leave it at that. As there was to be a day between our arrival and the grand event our friends suggested we spend that day on tour, and were there bright and early next morning to lead us gently to the minivan as we fought jet lag and tried to appear awake and personable for the journey. Naturally we were curious as to what we would be seeing that day. Both were uncharacteristically silent on this issue and we didn’t have the energy to pursue the matter. It was only when we noted the road sign that said “Mt St Helens” our adrenalin kicked in and we were suddenly wide awake. In 1980 we purchased a Plymouth hatchback In Massachusetts and embarked on a two month tour around the USA. We covered 34 states and saw all the touristy things with the added bonus of a tornado in Kalamazoo, being snowed in at Yellowstone Park, enjoying an earthquake in Bakersfield and of current interest the 1980 eruption of Mt St Helens. We’d stopped over with friends worked with in India who were pursuing PhD studies at that time, and they urged us to do two things. 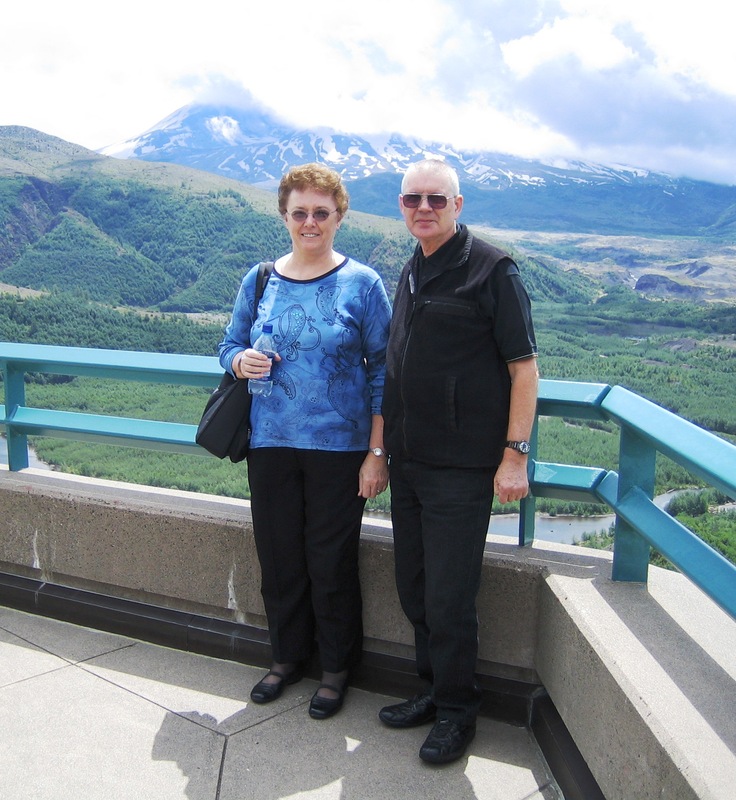 First visit Mt St Helens, and second stay an extra day with them. We stayed the extra day with Vi and Ralph, and that’s when the mountain blew. What would have happened if we’d proceeded to the mountain the day before, as originally planned? Probably we’d have been part of the dust raining across North America and beyond that fateful day. Our next stop on that occasion was to be Walla Walla, Washington, home to the Walla Walla sweet onion, and I can remember having to go due south and circle around to that rural and educational community to avoid thick ash fall. Ash was falling like snow and it cost us a small fortune to clean the engine and its appendages after emerging from that experience. We were still washing ash sediment out of the bodywork a month later when we sold the car in Washington DC. That experience had given us a continuing interest in Mt St Helens, and we noted news bulletins indicating the mountain was currently giving a grumble or two. Now we were heading for Mt St Helens! My friend Els gave a benign smile as he saw me reading the sign and assured me he’d not wanted to frighten us by telling where we were headed that day. Oh thanks! Well the fact that I am writing this shows the mountain behaved respectfully that day, and after 26 years we’d finally made it to the mountain. The Tourist Facility there had a lot of very interesting information on the volcano, and some spectacular movies of the actual eruption that killed many people and animals, and flattened the countryside to an incredible distance. The river banked up behind walls of uprooted trees and rocks until it finally broke loose. One day earlier and we could have been buried under the ash. I had a similar experience in SFO. Drove over the Bay Bridge to get to the international airport and on my arrival in Singapore next day my daughters who were doing their college in the Napa Valley phoned to tell me an earthquake had bought the Bay Bridge down. Another one day near miss! Unbelievable. Lotsa stories for the grandkids. Sweet Ian if there is excitement going on you are one to be sure and find it. 🙂 All your experiences have sure brought about some interesting and mighty fine writings though. I didn’t see mention of a hurricane or blizzard in your travels and I sure hope you never go through either of them I have been to Walla Walla and lived and worked in Seattle for a time but never visited Mt St Helens. I lived outside Seattle in 1980. We had wine and cheese parties when St Helens was doing the nasty, those parties were held on rooftops, with plenty of seating, sunglasses and large umbrellas in case of fallout. I still have a couple of pieces of jewelry and a vase made of ash from that pesky mountain. During that time there were plenty of predictions that Rainier would also erupt, I could see Rainier from my kitchen window. I watched the mountain with great interest each day with coffee. Glad your trip went without incident. This is an interesting and informative piece. I liked the way that you brought it to the present and then looked back to that fateful eruption. I am continually amazed at how many near misses we all experience during our lives. Each time most express gratitude and thanks. I am also always surprised to hear people describe disasters which they have experienced when they generally give thanks for what might have happened and didn’t rather than showing anger about what did. You are right. We almost decided to go to Mt. St. Helens on the day it blew and are glad we stopped over in Mosco Idaho instead. Sounds like you had a very close call in 1980. You actually purchased a car instead of rental – I suppose the numbers stacked up to favour a buy/sell rather than a rent for two months. I ask only because in 2014 we plan on long drive holidays in Australia and the USA. Returning to your trip – believe that get-together would have been one big bang – pun unintended. We bought the Plymouth for $1700 including insurance, did a complete circuit of the US over two months and sold for $1300 quick sale in Washington DC. In those days you wouldn’t have been able to rent for two months for $400. Don’t buy new as there’s too much price drop in the first year. You could do OK with a good second hand car from a reputable dealer.